Cast: Justin Whalin, Jeremy Sylvers, Perrey Reeves, Travis Fine, Dean Jacobson, Peter Haskell, Dakin Matthews, Andrew Robinson, Burke Byrnes, Matthew Walker, Donna Eskra; voice of Brad Dourif. Just like the good ol' days. Nothin' like a good strangulation to get the circulation goin'. Released to theaters just nine months after the previous sequel, the broader "Child's Play 3" shows signs of wear-and-tear all over it. Andy Barclay (Justin Whalin) is now sixteen and newly arrived at Kent Military Academy, where he befriends fellow cadets Kristen De Silva (Perrey Reeves) and Harold Whitehurst (Dean Jacobson) and quickly butts heads with the overbearing Cadet Lt. Col. Brett Shelton (Travis Fine), obviously an avid watcher of "Full Metal Jacket." 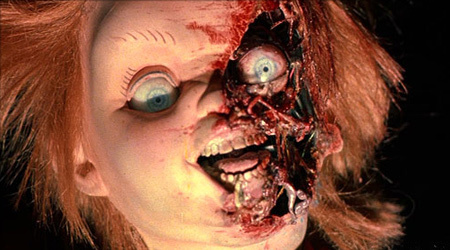 Chucky (voiced by Brad Dourif), the blood of his corpse mixed into the melted wax and plastic of a new Good Guys doll, is soon alive and kicking again. He tracks Andy down once more, but this time tells his secrets to impressionable young student Tyler (Jeremy Sylvers) before convincing him to play a rousing game of "Hide the Soul." "Child's Play 3" features an intriguing new central setting at the military school, but not a whole lot is done with it. The scares, meanwhile, are minimal, with Chucky finally starting to litter up his dialogue with aching one-liners and puns. Taking over for Alex Vincent, Justin Whalin (2000's "Dungeons & Dragons") makes a fine older Andy, and Perrey Reeves (currently on TV's "Entourage") and Dean Jacobson bring more layers to their characters of sarcastic De Silva and outcast Whitehurst than the script does. A climactic chase at a carnival and through an elaborate funhouse ride is inventive enough, but otherwise the rushed "Child's Play 3" is nothing but a faded memory of the series' superior former self.